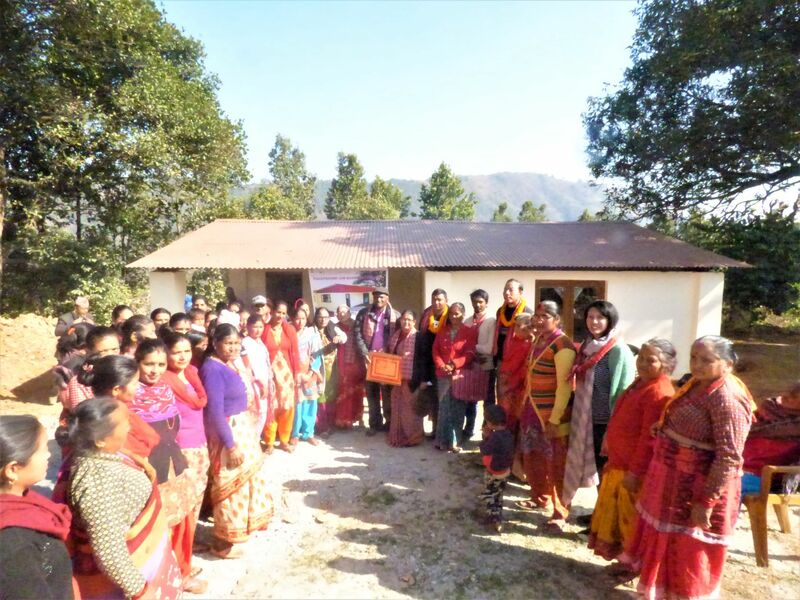 A group of 45 members named Dedidevi Women’s Group requested for a center to conduct meetings and regulate activities as they had to sit under the tree or on a barren land of others. They even have to depend on the weather, sometimes they had to cancel their meetings or programs due to rain. 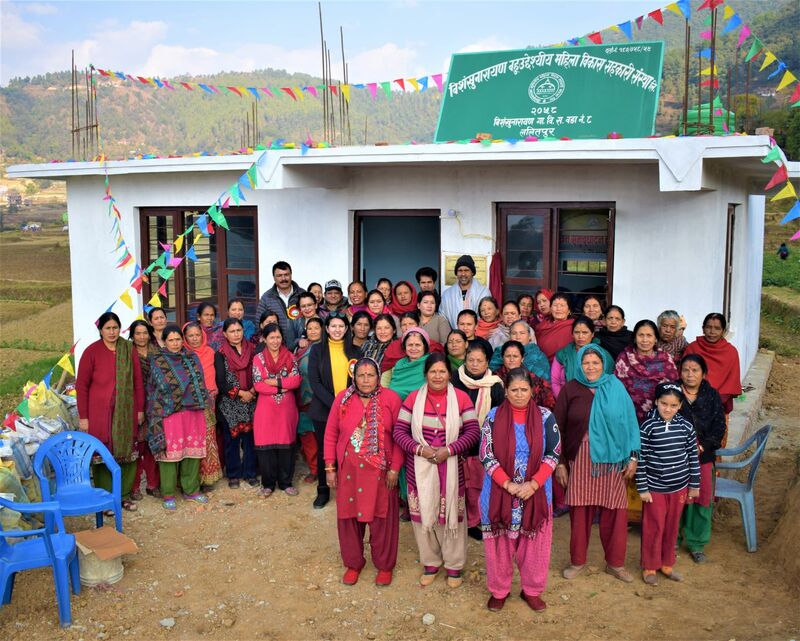 So seeing the need of the center in the community, NJSI decided to build the women center in their village which is located at Mandendeupur Municipality-7, Guragaitar, Kavre. On 9th January, 2018 NJSI team went to handover the women center. A total of 70 people were present for the program. The program started around 11:30 a.m. in the presence of Vice mayor of Mandendeupur- 7, some government officials and beneficiaries with welcome speech. Social Audit was done by NJSI staff and finally government official cut the ribbon, Fr. 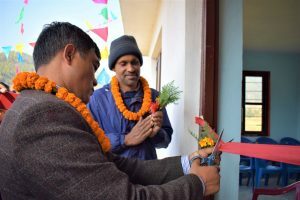 Arul handed over the key to the Vice Mayor and the Chairperson of the women’s group inaugurated the center by opening the door for all the attendant of the program. The work of NJSI was appreciated by everyone presented there and appreciation certificate was provided to the team. They were happy to receive the women center in their community. They even requested for some life skills training programs which would help to sustain themselves. Thumka Danda is a village located at Roshi Rural Municipality in Kavrepalanchowk District. The village is on the difficult terrain and mostly populated with Tamang indigenous community with people of Brahmin and Chettri community as well with 105 households. They do not have any water source nearby and throughout the year except the monsoon season village is very dry. They had to walk for 2 or more hours daily to fetch water from Roshikhola carrying it on a bamboo basket in plastic bottles. NJSI helped the village by building a water tank to store and supply water to the households by laying pipelines and constructing 17 water taps for the various use of villagers. 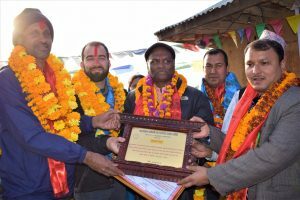 On 7th January 2019, NJSI team went for the handover ceremony of the water supply project. The program was too lengthy with the speeches from government officials. Group of children sang self-made song about the project, the availability of water near their house and new opportunities the tap would now provide young children, thanking us for all the support. All the guest inaugurated the tap and handed over it to villagers. 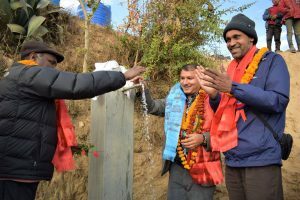 Villagers expressed their utmost gratitude towards the whole team who worked for the water project. They mentioned that in earlier days, the women in the village had to wake up early in the morning, sometimes even in late midnight to walk almost 2 hours to fetch a jar full of water. Sometimes, their walk would go in vain when they would have to return without a single drop of water. 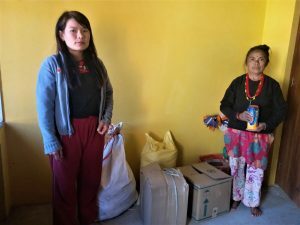 A Tamang women even laughed saying that she would finally get to sleep till late mornings without worrying about fetching water now. NJSI has been supporting the children with special needs of Shree Bhagawati Care Center and Kali Devi Care Center which is located at Kavre district from the beginning and in every two or three months as per the need, NJSI has been providing the nutritious foods and medical interventions to the children. On 4th January, NJSI team went to these places to supply the nutrition food and take the blood sample of the children for thyroid test. There are 8 children in Kali Devi Hostel and 21 children in Bhagawati Care Center. The set of nutritious food that was provided included Grains, Flours, Horlicks, Sarbottam Pitho, and eggs. At First the team went to Kali Devi Care Center where the children were so sensitive and scared seeing the injections and all the lab equipment. The team applied different techniques to convince the children so that they would allow the technician to take the blood but still they were unable to take sample of 2 children. 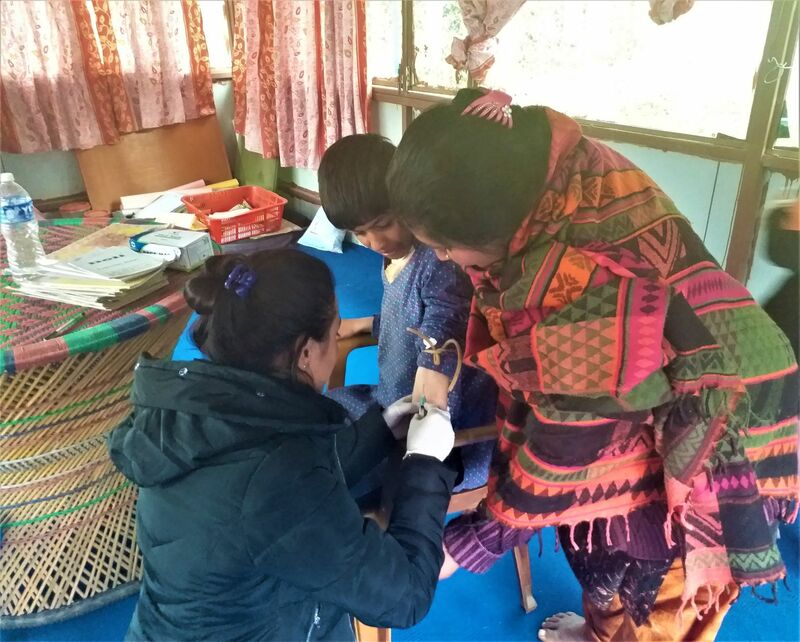 As prescribed by the doctor, 3 children from Bhagawati Center had to repeat the thyroid test. So on the same day, NJSI team went to Bhagawati center which is quite far from Kalidevi to collect the blood sample of those 3 children. One lab technician accompanied with us to collect the sample. Children were very cooperative here in comparison to Kali Devi Care Center so the technician easily took the blood sample from them. The children from both the center were quite happy seeing us, they gave us a warm welcome with their cheerful smiles and greetings. The caretakers also were really happy seeing the food and the medical provision. 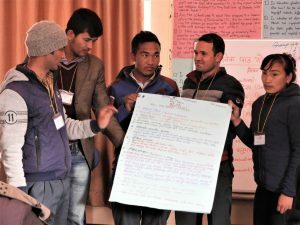 To introduce the idea of holistic development and implementing them in the classroom knowing each students’ context and experiences, Integrated Pedagogical Paradigm (IPP) was introduced to teachers as a method which focuses on the holistic development of children rather than only focusing on the book and knowledge based approach. 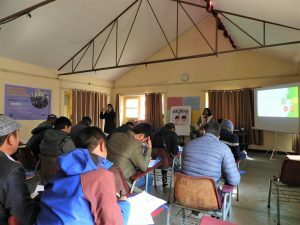 On 27th December, 21 teachers were invited from government schools of Sindhupalchowk and Dhading to NJSI office, Bakhundole to expose them to different teaching methods that can be fruitful in teaching and learning approach. 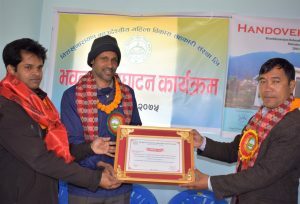 It was a two day long program facilitated by well experienced teachers of St. Xavier’s School, Jawalakhel. Day one focused on briefing the flow of teaching and learning: Context, Experience, Reflection, Action and Evaluation and techniques of making lesson plan. The session incorporated different group activities, reflecting on songs and metaphorical stories and applying them as a teacher. Day 2 dealt with topics such as: Multi intelligence theory, Learning and Teaching styles, Understanding adolescents and Non-violent communication. Teachers seemed happy with the training and were enthusiast throughout the program. Both the presenters as well as the participants indulged in interactive conversation. Teachers gave a positive feedback on content of the program and the overall management. Most of them also mentioned in the feedback that they found the program effective and would want to participate in more of these training. IPP as a whole was a new approach to education for many teachers, so they tried their best to grasp it and are looking forward to implement them in their school and classes. 4 members from NJSI went to Mahadevdanda, Godawari to handover the women center to Bisankhunarayan Bahuudeshya Mahila Biakash Sahakari Sanstha women group on 28th December, 2018. Mayor, Ward chairman, section officer for Women and children’s department along with 60 members of women group were present on inauguration and handover ceremony. The ceremony started at 12 and lasted for an hour keeping the program precise. The women group managed everything properly and was able to invite all the concerned authorities including those who supported continuously and the stakeholders of the program along with all the beneficiaries of women center for the inauguration program. Speeches, reading of financial statement by women group and social audit were the activities followed. At last the key of women center was handed over to chairperson of that group. Snacks, tea and group photo marked the end of the ceremony. The women of that group is very active and hardworking. From inviting guests to concluding the program everything managed themselves. They delivered financial statement of the women center in front of everyone which was quite interesting and unique. All the participants present there were very happy to get a women hall that they can count of their own. They expressed their gratitude in their speeches and personally too. The ceremony was successfully conducted.